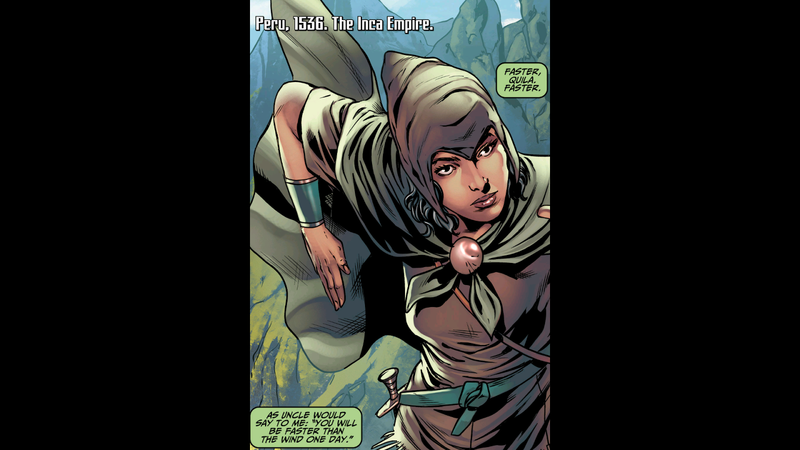 Actually I'm assuming she's an Assassin, the comic hasn't clearly stated that she is.. but anyway..
Quila is 1 of the highly trained & skilled messengers, who are called Chasqui, although being a woman, she isn't accepted by the other male Chasqui. So happens that she intercepts some bad news and needs to deliver a warning urgently but that doesn't go smoothly as expected.. While we have moved away from the first arc, where the historical section was set during the times of the Salem witch trials, the modern day story is still connected. It continues after the events of the first 5 comics, and Charlotte & the gang run into more shady characters. Managing to find some clues, Charlotte is now back in the Animus, looking for more information in a different period. The story-writing isn't too bad, but the focus is more on the modern day timeline, so the cooler, historical assassins don't appear as much in the comics. With the new Templars series & another new series being announced, it's going to be a busy year for an AC fan like me, even without a new game this year. It will be interesting if the different comic series tie in together somehow, we'll have to see how it goes! Battleborn's Open Beta coming soon! Assassin's Creed Movie Collectibles Announced!